Here's my temperature blanket progress for May! See that one darker pink hexi hiding in the corner? That was from a 90 degree day! I actually added one more color to my color chart because I realized that here in Utah, we definitely get into the 100s, and I didn't want to have the same color for both the 90s and 100s. I moved my darker purple-pink color to the 100s and added this dark pink for the 90s. I'm loving the progress! While I absolutely love crocheting my temperature blanket, crochet is not the only form of a temperature craft! Think about the crafting medium you enjoy most. Maybe it is quilting, maybe it is lettering, maybe it is embroidery. All of these mediums can lend themselves to temperature projects, but you might just have to think outside the box. I have listed a few different ideas to get you started and to get your ideas flowing. While searching for crafts on Instagram, I came across this amazing temperature cross stitch pattern by Hetti Ruckert. She has the pattern for this cross stitch on her blog, and you can link to it HERE. You start in the very center and work your way clockwise around the center. You pick your colors and your temperature chart, and do one square a day. She even has a chart with the days of the year so that you can see where you should be each day. I have loved working on this temperature cross stitch, and it is really easy to work in just a five by five square each day! If your favorite medium of choice is watercolor or painting, you can easily do a temperature painting. I started two different temperature watercolor paintings. One I did on a really large piece of watercolor paper, and the other was on a smaller piece of paper. On the large piece (as shown above) I calculated and measured 364 squares. 365 squares just didn't divide very evenly for this piece. I made 14 columns and 26 rows. Do a little calculating to see how big your rows and columns need to be to fit evenly on your paper. I then made a color chart with my watercolors and added corresponding temperature ranges. Everyday, you just paint the color of the day into one square. For this painting, I chose to paint a circle in each box. For this smaller piece of paper, I divided it into 90 boxes. This project will end up being four pieces of paper when complete, which I think would look awesome all hung up together at the end of the year. I decided to fill in the entire box for this project as well. These watercolor projects will create unique and personal works of art to show off in your home. I have a thing for pom poms, so of course I had to throw a pom pom garland in with the temperature crafts! This one is only for the month of January. I thought it made an interesting pattern though, and I like how it is artistic in its own way. To make a pom pom garland, pick a yarn colors and temperature ranges, and make one pom pom a day in the color of the day. I made my pom poms two different sizes to add a little more dimension, but you can keep them all the same size if desired. These are only a few possibilities for fun temperature crafts. Get your creative juices flowing, and share your ideas with me! I love seeing new ideas! I got to use pink this month! We took a trip to Arizona and the Grand Canyon at the beginning of April, and I used my first pinks of the year! It also has been nice in Utah too lately, so I even got to use a little pink toward the end of April at home as well. I'm loving the warmer colors that I am getting to use as winter drew to a close! Here is my progress through the end of March. Myu temperature blanket is well underway! I actually have not missed a day yet! I think there was one day that I didn't get to my crocheting at night, but I made it up the next day. It's much less overwhelming if I just stay on top of it each day! I love seeing the progress. We have had an unseasonably warm winter here in Utah, so I have used a lot more yarn in the 40-59 degree range than I ever would have imagined. I am almost already out of my 40s yarn! And my 50s yarn is also running low. Crazy winter. The little section of orange and yellow hexagons was from when our family took a trip to California. I have decided to use the high temperature for the city in which we are sleeping each night. It is hard to tell from this photo, but I also have one hexagon with a silver strand running through it. I am crocheting in the silver thread on special days. That one happened to be one of my daughter's birthday. We finally got a few colder days this month...I guess only three days! And it was only in the 20s! That is where that clump of blue comes into play. It's looking fun so far! It is a good way to remember the year as well. I like looking at the little orange section and remembering our trip to California. It's a journal of sorts! All over Instagram and Pinterest, you can find darling blankets and pillows with pom poms attached to the edges. I have loved these blankets, but I haven't loved their big price tags! There is a solution though: attach your own pom poms to blankets and pillows! Places like Amazon, Target, Walmart, TJ Maxx, and Ross are great places to find inexpensive throw blankets and pillows that are great for attaching your own pom poms or tassels. You only need a few items to customize these cozy accessories for your own home. To create this double tassel blanket, I wanted the tassels to dangle from the inside of the blanket. I am no seamstress, but I discovered that thinner, twin-sized blankets make a great throw-sized blanket when folded in half. If I sewed around the edges, I could insert the tassels where I wanted them. This same technique can be used with pom poms as well. I started by making a bunch of tassels. I then attached three pieces of yarn through the top of each tassel with a plastic yarn needle. I pulled them half-way through so that I had six strands at the top. I then braided the strands holding two strands at a time to make it thicker. I tied a knot at the very top of each braid. I folded my blanket in half and pinned the tassels on the edges of the blanket. I whipped out my trusty sewing machine (that has never been used for anything other than sewing a few straight edges here and there! ), and I got to work! Super easy, and pretty quick! To attach pom poms or tassels to pillows or blankets that have any material that is not a large stitch knit, you will want to use a hand stitch method. I use a large darning needle to do this. I find a yarn that is about the same color as the pom pom or tassel but that is slightly thinner. This will help you thread the needle and will go through the fabric more easily. I sew through the edge of the fabric, and pom pom or tassel, then tie a knot. The knots can then be slid around back to the pom pom or tassel to hide it. Sometimes it can be tricky to get the needle and thread pulled through the fabric, but it usually works if you wiggle it through. I made all of my pillows using this method. If you find a cute, chunky, large stitch knit blanket, you can use another technique to attach your pom poms or tassels. Because the stitching is large, you can use the natural holes to tie your pom poms on. I like to leave the ends long on my pom poms so that I can easily find the center of each. This makes it easier for stringing yarn through and attaching to the blanket. I use a plastic yarn needle because they have wide openings and go through the blanket and pom poms easily. First string through the center of the pom pom. This is when those pom pom ends come in handy. You can quickly find the center knot of the pom pom by following the end strings. String under this center knot and leave some string hanging. You will use the remainder for tying a knot. To attach your pom pom to the blanket, figure out how far apart you want to space them on the edges. Count several stitches up from the bottom of the hem, to insert your plastic needle. The pom poms I made were very large and heavy, so I wanted to place them a little further up on the edge just to make sure they didn't pull out the stitches on the bottom row. I strung the yarn through the third row of stitches from the bottom, then tied a knot in the yarn. I then repeated this same process with the same pom pom just two stitches to the left so that the pom pom would be attached with two knots. You will want to trim the ends of your knots to make them about the same length as your pom pom strands. You also need to trim the ends of your pom pom center string. The two strings connecting the pom pom to the blanket can now be pulled down so that the knots are now lying against the pom pom. This hides the knots within the pom pom strands. Continue attaching all of your pom poms in the same manner. If your pom poms aren't super heavy, you can actually use your center string of your pom pom to attach to the blanket. You will probably only need one knot with smaller pom poms, so just using the center string should be enough to connect the pom pom. One thing to note with these pillows and blankets is that with the hand-tied pom poms, you will probably want to hand wash your blankets to protect the yarn from being pulled out of the pom poms. Little hands also find these pom poms irresistible (who doesn't!) so you will want to be careful with these around your little ones. A few weeks ago, my mom suggested that some of the girls in our family make temperature blankets. My first thought was, "What is a temperature blanket?" But after a quick search on Pinterest, I soon discovered that it was something right up my alley! A temperature blanket (or scarf, or whatever item you would like to make) is where you crochet or knit a small amount each day in a color that is dependent on the high temperature of the day. You pick your temperature ranges, then you select a color scheme to go with your ranges. One color per range. My mom and started by going to Hobby Lobby and picking our colors. We decided on ten colors in a rainbow pattern. Then we chose our temperature ranges. Since we had ten colors, we decided that we would do ten ranges starting with <10 degrees, and ending with >90 degrees. I live in Utah, so it gets cold in the winter and hot in the summer. This winter has been really mild though, so we'll see if I get to use some of those cold temperature colors! Maybe at the end of 2018! You also need to decide upon a pattern for your blanket. 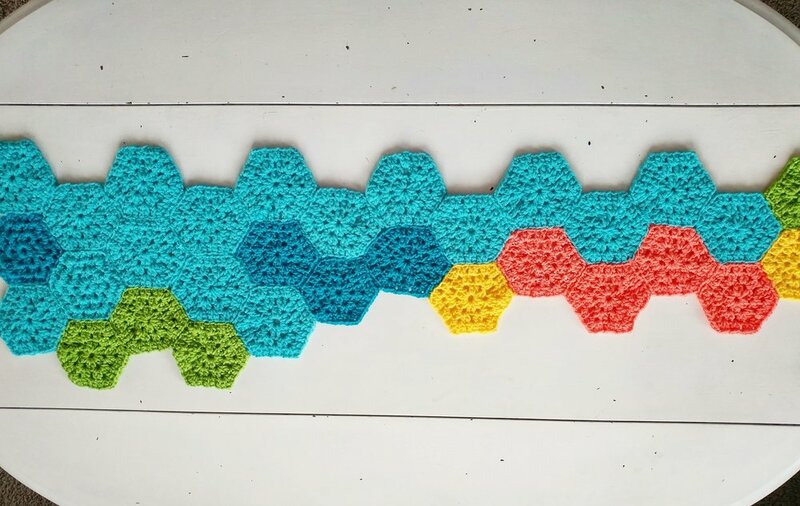 I love granny hexagons, so I wanted to make one granny hexi a day. I looked through patterns on Pinterest and YouTube to find one that I thought fit the best. I will sew them together as I go so that I don't forget which color goes on which day. I'm worried that this blanket might get rather big, but that's okay. Bigger is better than smaller! My husband, who has never crocheted before, decided to do an easy double crochet pattern. He chained about 165, then will do a third of the blanket each night in double crochet. The small amount each night makes it more doable! I'm hoping to stay on top of this project! I know there will be nights when I can't get to my hexi of the day, but hopefully I will be able to catch up. It's just a little bit each day! I can do it! I'd love to see your photos if you decide to tackle it too! We love to give out little neighbor gifts at Christmas time, and while we often do some sort of baked goods, I just didn't have time this year to make homemade treats. I decided to keep it easy this year by giving out cute little gift wrap accessory kits. I also bought some Christmas colored bakers twine from Amazon. I bought a two pack with both the red and white and red, white, and green colors. You can find them here. I just cut off about a yard to include with the washi tape. The kraft tags are also from Amazon. They even came with some jute twine, so if you didn't want to buy the bakers twine, you could just use the jute that came with these tags. I ended up buying two packs of the tags so that I could put a few inside each bag. I put everything together into clear poly bags and tied them with bakers twine. I had a few little bottle brush trees left over from a craft project, so I added a few trees to some of the bags. I attached a little tag where we could write our name and each recipient's name. And that was about it! These were easy, practical little gifts to let our neighbors know we were thinking of them during this holiday season! It is no secret that I am a fan of pom poms. I looooove pom poms. I make so many, that I often have a bunch left over - some are from garlands that didn't work out, some didn't turn out how I envisioned, and some I made for photo props. Whatever the reason, I end up with quite a few extras. Last year I decided to put some of these extra pom poms to good use. We have two different Christmas trees in our house. One is our hodge podge tree that is covered in our family ornaments that we pick each year, and the other tree is my "pretty tree" with matching ornaments. I was getting a little tired of the gold ornaments that I had on my pretty tree, so I decided to make it a pom pom tree! I loved my green pom pom tree, but when I found a white tree on clearance after Christmas last year, I thought that it would be perfect with pom poms! I have a slight obsession with craft supplies. Okay, I'm a craft hoarder. I can't help it! I just love all things crafty. If you are like me and have a surplus of craft supplies, this project will be perfect for you. Paper chandeliers are a gorgeous way to add a little color to any space, and each one is unique and personalizeable. The great thing about these paper chandeliers is that you are the designer. I researched other paper chandeliers online and found many different varieties and forms. After a bit of trial and error, I found the method I liked best. You can make these your own by making them bigger, smaller, more colorful, less detailed, etc. For this tutorial, I'm going to show how to make a 19" chandelier, but please keep in mind that these instructions can be modified for any size you'd like to make. To start you need to prep all of the items you will be putting on your chandelier. Cut your string into 60" strands. I used colorful embroidery floss. I cut eight strands for this chandelier, but if you are making a smaller one, you may not want quite as many strands. You will also need to cut your paper straws into smaller pieces. Because this is a big chandelier, I cut mine into 3" sections, but for smaller ones, you may want to cut your straws into 1.5" pieces. You will probably need more straws than you think...I ended up having to cut more half-way through, and it's easier to just cut a bunch at the beginning. I found these paper straws at Michael's, but Amazon also has a good selection, and Target often carries them in their Dollar Spot and party sections. Next, you will need to cut a bunch of circles out of your tissue paper. I used a 1.5" scalloped hole punch to do this, but you can also just cut them by hand. I folded the tissue paper over several times and then punched so that I could punch through a bunch all at once. The tissue paper I used was from Target and had a different color on each side. Even if yours isn't different colors, any color will look cute. I also found that you will need more of these tissue paper circles than you think. You will use a bunch! Punch a lot now so that you do not need to stop in the middle to make more. Now that you have your prep work done, you can start stringing your chandelier! Take your pieces of string and fold them in half. We want double the number of strings, which is why we fold it. If you want, you can slide a bead onto the folded part and then tie a knot, or you can leave the bead off and knot it. Just make sure you leave a little loop so that you can hang your chandelier. To start stringing, take two strands of string at a time, and thread your needle. Start stringing! You can keep a consistent pattern, or change it up as you go. I decided to do all small tissue flowers and straws for the top half of my chandelier. Because the tissue paper is flat, I wrinkled the paper up a bit as I went along to give it a little dimension. Continue to string your two strands of thread until you get to the desired length. I strung until about 14" was filled. At this point, to keep everything from sliding off, you can attach some washi tape to the bottom. If you are using heavier materials like lots of beads on this strand, you may want to use a binder clip to keep everything from sliding. But for lighter items, the washi tape works pretty well. Continue to string every two strands of thread until they are all complete. You will want to try to make these sections about the same length as this will help keep the top half of your chandelier fairly even. The next step is to connect your string to your hoop. I like to lay mine on the table on top of the hoop, and try to place the strings evenly around it. Tie each section of string onto the hoop and secure with washi tape. This will help hold the sections in place, but you will be able to adjust them later even if they slide around. Now we are going to start stringing together the bottom half of the chandelier. I wanted the bottom of my chandelier to be more full, so I prepared some pom poms and bigger tissue paper flowers using the left over tissue paper scraps. To make the bigger tissue flowers, I just folded strips of paper into a circular shape. If you string through the ends, it will hold itself together without any glue, but you can always add a few dots of glue to secure them. To start stringing the bottom half, take just ONE strand from a section, and thread the needle. You will continue to string as you did before adding straws, paper flowers, pom poms, beads, etc. Now take a single string from the neighboring section and string that one like you did the first. Once they are both about the same length, you are going to join them together making a triangle. Thread the needle onto both of the strings, and add your straws and flowers again. Secure the end with more washi tape. Continue all the way around the hoop. When all the strings are complete, gather up all the sections and hold them so that the chandelier is hanging upside down. Connect all of the strands with a bead and a knot or even just a knot. I added a bead and attached a pom pom to the bottom. A tassel would also be a cute addition to this bottom part. You can hang your chandelier from a 3M hook. I like the kind that has a metal piece that can move to adjust for hanging. I love using these as a hanging centerpiece at parties or even above my daughters' dresser in their room. Such a fun way to add some color to any room! Hopefully it can help you use up some of that craft stash too! Enjoy!